Hi!I'm Emerald,the owner of this club...!Ok..it's really not me but its Mr.xOxO .He's the one who created this and just gave it to me bcoz he's a bit tired and and he's gonna have to manage 2 clubs! *_nick club_ & this one! *And it's true also that I'm now managing 2 clubs too! *Po-kawaiii Club and this one! *But it's not that tiring...It's kinda kills boredome!Well,the reason Mr.xoxo created this club is because Bcoz Happy Tree Friend but CUTE!!! 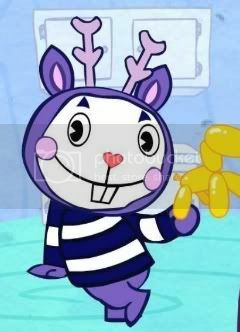 And For The People Who Loves HAPPY TREE FRIENDS. 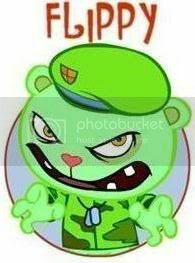 Happy Tree Friends is a Flash cartoon series by Mondo Mini Shows, created by Rhode Montijo, Kenn Navarro, Warren Graff, and Aubrey Ankrum. The show has become a popular internet phenomenon since its debut and has also won a cult following.There are 20 main characters in the HTF And Friends series, all of whom have unique personalities and appearances. Cuddles is a yellow male rabbit with pinkish cheeks who inexplicably wears pink rabbit slippers. Cuddles is one of the four primary characters in the series. Like Giggles, Toothy and Lumpy, he appears in many of the advertisements. 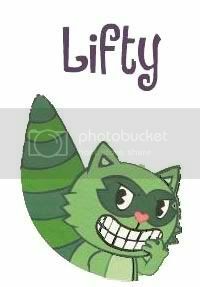 Giggles is a pink female chipmunk who has a white diamond-shaped marking, a white oval pouch, and wears a big red bow on her head. Giggles is one of the primary characters of the series and appears along with Cuddles, Toothy, and Lumpy in the advertisements. She may have also been one of the first characters to be created along with Cuddles.She has the personality of a young girl, as she enjoys frolicking through flowers, having tea parties with friends, ice skating, and having a shy and sweet demeanor. Toothy is a purple male Beaver with very large gapped teeth (hence his name) and freckles.He is generally a very friendly character who likes to play around now and then, particularly with the younger characters. He admires Splendid and even dresses up as him for Halloween. Lumpy is a blue male moose with clean teeth pronging out of his mouth, bright disorbited eyes and mismatched antlers.Lumpy has appeared in the most episodes out of all the other Tree Friends, and most fans consider him the odd one out due to his height and lack of a normal Happy Tree Friend-styled face.His low intelligence is often the cause of other characters' deaths, and sometimes his own. In fact, Lumpy has caused the death of every character at least once, except Cro-Marmot and Splendid. Petunia is a blue female skunk with a light blue arrow marking on her forehead, which is connected to the triangle shaped marking on her back. She wears a pink flower on top of her head and a pine scent deodorizer around her neck and a white pouch,Petunia is rarely seen without her flower or deodorizer.Petunia is often seen in the series with Giggles. They appear to be best friends and they run a lemonade stand together. Handy is an orange male beaver, with unexplained amputated arms. The stumps are covered with bandages. Handy is a construction worker and wears a tool belt and a hard hat (the typical dress of most construction workers). His dam mostly consists of tools that are operated by hand. He is also the second character without visible ears. 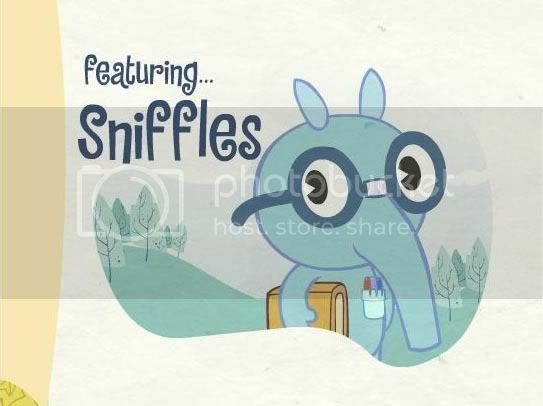 Sniffles is a blue-gray male anteater who is one of the most intelligent characters in the series. He is the second character without a heart nose and a pair of buckteeth. He usually likes reading and doing science and math problems. 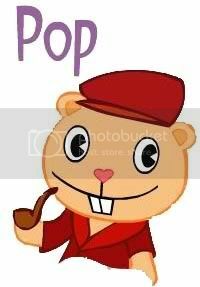 Pop is a light brown male bear with a red beret.He has never appeared in any episode without Cub excluding his BBQ smoochie. His son Cub often dies as a result of both his attention and inattention - although it is clear that he loves him. 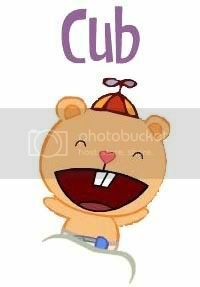 Cub is a light brown male bear, who is the son of Pop. He has the appearance and personality of a baby but the intelligence and mobility of a young child. 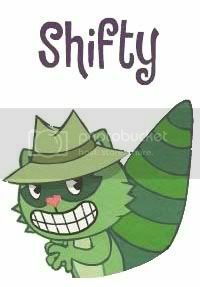 He's the youngest and smallest character of the Happy Tree Friends and his eyes, which are unlike those of the other characters, give him a more infantile appearance, but despite these traits, he still dies and gets injured. Flaky is a red female porcupine whose quills are full of dandruff, thus the name and she is the third character without visible ears. Flaky is one of the most popular characters in the series and has the identifiable personality of being a very shy and timid character ever since she had a traumatic childhood event. Sometimes when she gets scared while travelling on a bumpy ride she gets sick and vomits, like on a roller coaster or plane She is afraid of chicks as seen in "From A to Zoo". 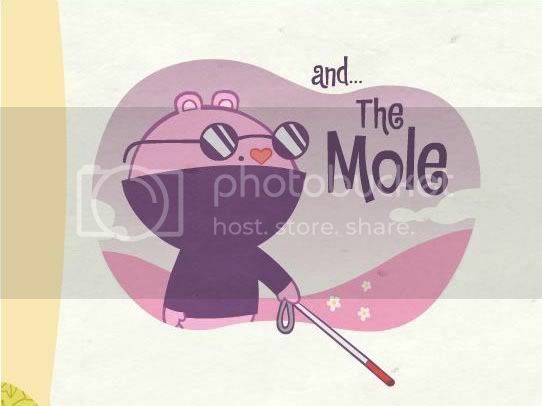 The Mole is a blind magenta male mole with dark glasses with a resemblance to Walden from Wow! Wow! Wubbzy!. On his face, The Mole actually has a mole. The Mole is known for his facial mole. He wears a purple turtleneck. Disco Bear is a golden male bear with an orange afro and two sideburns who likes to dance to disco music (his name "Disco Bear" comes from "disco ball"). He wears 1970s style clothing, including a yellow jacket, yellow bell-bottom pants and orange and white dancing platform shoes. Russel is a Pastel green male sea otter with typical pirate accessories like a Jolly Roger's hat, a striped red/white shirt, a hook, an eyepatch and two wooden peglegs. He enjoys fishing, sailing and eating seafood, one of his animal instincts, especially mussels, which was why he was named Russell. Cro-Marmot is a light-green male marmot frozen in a block of ice. He is somehow able to perform many tasks off screen while entirely encased in ice, such as throwing snowballs, somewhat akin to how Handy can perform construction and other tasks without any visible hands. To keep himself frozen, Cro-Marmot stays mainly in cold areas, and sometimes drives an ice cream truck. Flippy is a green male bear with dog tags and a green beret with checkered crest, and camo shirt. There is evidence to suggest that he fought in the Vietnam War, particularly his obsession with making booby traps inspired by the Viet Cong, as well as a flashback of his experience of being held captive by them (as seen in Easy for You to Sleigh). Splendid is a pale blue superhero male flying squirrel. He is largely based on Superman; he can fly at extreme speeds, shoot laser beams from his eyes, has super strength, supersonic hearing, can turn back time and can breathe ice. He is often seen doing housework until he hears a character that needs to be rescued. Login or register to add happy tree friends club as your friend!